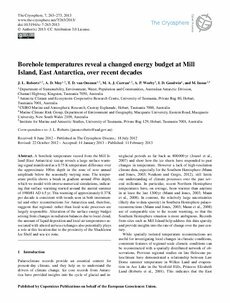 A borehole temperature record from the Mill Island (East Antarctica) icecap reveals a large surface warming signal manifested as a 0.75 K temperature difference over the approximate 100 m depth in the zone of zero annual amplitude below the seasonally varying zone. The temperature profile shows a break in gradient around 49 m depth, which we model with inverse numerical simulations, indicating that surface warming started around the austral summer of 1980/81 AD �yr. This warming of approximately 0.37 K per decade is consistent with trends seen in both instrumental and other reconstructions for Antarctica and, therefore, suggests that regional- rather than local-scale processes are largely responsible. Alteration of the surface energy budget arising from changes in radiation balances due to local cloud, the amount of liquid deposition and local air temperatures associated with altered air/sea exchanges also potentially plays a role at this location due to the proximity of the Shackleton Ice Shelf and sea-ice zone.